According to a Microsoft blog entry, Office for Mac 2011 Service Pack 1 (SP1) will arrive next week. It features “improved Outlook syncing support”—but with a big caveat. 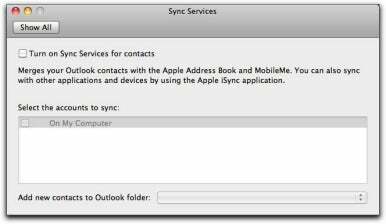 Prior to the release of Office for Mac 2011, Microsoft’s productivity suite shipped with Entourage rather than Outlook. Entourage’s Calendar function was capable of syncing with iCal and MobileMe. The syncing worked, but not always well. Most notably, as I can personally attest, there were frequent problems with duplicate entries. Perhaps that’s why, when Microsoft released Office for Mac 2011 last fall, it omitted calendar syncing from Outlook. Only Contact syncing was maintained. In other words, Microsoft is adding support for calendar syncing via an update that is already incompatible with Apple’s latest MobileMe software. This has to be at least a bit embarrassing for Microsoft. It’s like finally adding Snow Leopard support for a product after Mac OS X Lion is already shipping. On a related note: Will the new update add back other Entourage features that were dropped in Outlook, such as Redirect and Resend? We’ll find out next week.